From Barbie dolls to Disney princesses, long, flowing hair has often been depicted as part of the ideal of feminine beauty. But some young women suffering from alopecia — a hair loss condition in some or all areas of the body — are challenging traditional beauty standards and promoting inner femininity by abandoning their wigs. By baring it all and embracing their baldness, these women are finding confidence in the idea that hair isn’t everything. “I felt like I was putting on a mask and I didn’t like it. I knew that I was loved for me and not because of my outward appearance,” says Erin Bauer, 31, who started losing her hair as a teen. Alopecia is a common reason for hair loss in women, a condition caused by an abnormality in the immune system in which it attacks its own body. Jeff Biernaskie, a researcher and associate professor of stem cell biology at the University of Calgary specializing in tissue regeneration through hair follicles, says baldness is caused by degenerating cells. Bauer was diagnosed with alopecia areata when she was just 14-years-old. “I lost my eyebrows and my eyelashes along with the rest of the hair on my body,” Bauer says. But Bauer later developed alopecia totalis and alopecia universalis, the second and third stages of alopecia that led to the loss of hair on her scalp and body. “The despair that came with that [alopecia] and the feeling of loneliness were so all-encompassing during that period of time,” Bauer says. For Bauer, hair had been a huge component of feminine beauty standards and her hair loss turned her to darker thoughts. But in time, Bauer learned that hair isn’t everything and began embracing her baldness with pride. “I spent a lot of years trying to change my mindset and see the positive things that were coming from [losing my hair] and focus on that,” Bauer says. Most people think of hair loss as a male issue, but according to the American Hair Loss Association, 40 per cent of hair loss sufferers are actually women. Biernaskie speculates that these numbers are fairly similar in Canada. “I didn’t realize how much a problem [hair loss] was … I was expecting a whole lot of calls from men that were losing their hair but what I was struck by the number of women that actually contacted me,” says Biernaskie. Erika Roddick is no stranger to the isolation caused by baldness. Diagnosed with alopecia at 19, Roddick says she has faced several unpleasant public reactions. Aside from typical mockery from children, Roddick recalls the time when she was mistaken for a man. She had been working on a construction site in the cold Calgary winter when she stepped inside Chinook Centre to use the washroom in baggy clothes. “I realized that a woman was yelling at me. She was yelling, ‘Excuse me, sir. This is the women’s washroom’,” Roddick says. But for Roddick, that’s where real life and fantasy starkly split. Construction work meant she was not able to wear wigs on site, which was liberating. 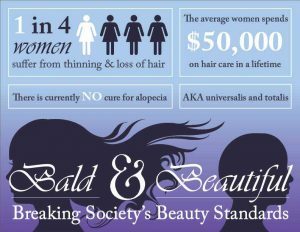 Although there are treatments for alopecia such as prescribed topical solutions and multivitamins specifically for hair loss, the constant pressure from society to be beautiful limits many women. “I was getting cortisone injections in my scalp and it was painful. It wasn’t helping my body, it was hurting it. So I said, forget it. If [hair loss is] gonna happen, it’s gonna happen,” says Sherry Smith-McAdam, a Calgary woman with alopecia universalis that left her virtually bald. But Smith-McAdam’s family is helping her confidence grow. One of her sons has also developed alopecia. His resilience has inspired Smith-McAdam to live boldly. “He had a better attitude about it than I did when I first got it. He was kind of like, ‘it’s only hair’ and my daughter actually does my eyebrows now, she does microblading,” Smith-McAdam says. Bauer, Roddick and Smith-McAdam are using the opportunity to raise awareness for the autoimmune condition and inspire others who have been diagnosed with alopecia. “I don’t mind if anyone wants to see my bald head — in fact, I ask people if they want to see it!” Smith-McAdam says.